There are lots of cycling activities in and around Gosforth over the summer including family cycle rides, children’s cycle coaching, Dr Bike sessions, challenge rides and even a Shakespeare play by a cycling theatre company. If you know of any other related events please do let us know so we can add them into the programme, and keep checking back as we’ll be updating the list with more activities as they are confirmed. Sunday 17 June 12- 3.30pm Meet at the war memorial in Gosforth Central Park from midday for a 12.30pm start. Thursday 21 June No organised activities but it’s a good day to leave the car at home and walk, cycle or take public transport instead. See also the National Clean Air Day website. Thursday 28 June – Sunday 1 July Take Part in the Tyne 6 Bridges ride (10-15 miles register by 10/6) or the Cyclone Challenge (34-106 miles register by 20/6), or watch the National Time Trial and Road Cycling Championships. See the Cyclone Cycling website for costs and details. Saturday 7 July 9.45 – 10.45am Term-time cycle coaching in Exhibition Park. See the Gosforth Road Club website and Facebook page for details. See also the Ashburton Residents web page. Cycling Without Age will be there with their Trishaw for those who can’t ride themselves to feel the wind in their faces. The Cycle Centre will also be there showing off their range of e-Bikes. Newcastle Bike Polo will be along from 3pm on the basketball court. We’ll also have some temporary racks for people to park their bikes on the day,For other activities see the Facebook events page. SPACE for Gosforth Ride together from Gosforth to the start.Meet at Gosforth Central Park War Memorial at 10:30 leaving at 10:45. Please see below for the route and further details.Other activities include Music, food and drink, fun and games, demos, giveaways, activities, challenges, face painting. See the event website for more details. See here for pictures from last year’s event. Saturday 11 August 6.30pm The Handlebards, the world’s first cycling theatre company, are putting on a bicycle-powered production of Shakespeare’s ‘Twelfth Night’ at the Cycle Hub on the Quayside. See below for a preview / Book tickets via the Handlebard’s website. Saturday 1 September 6-7pm Hear Megan’s story of how she took up cycling following a stroke to speed up her recovery, and only three years later won Paralympic gold. Details & tickets via the Great North Museum website. Sunday 2 September Meet at the war memorial in Gosforth Central Park at 10am. More details on the Let’s Ride website here. 15 September 9.45 – 10.45am Term-time cycle coaching in Exhibition Park. See the Gosforth Road Club website and Facebook pagefor details. 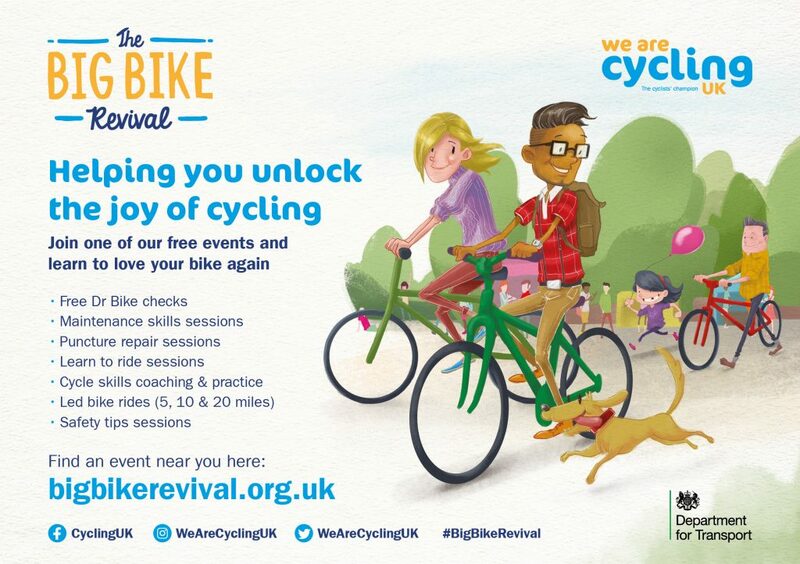 Come along to a free Dr Bike session and get your bike fit for the summer. During the Dr Bike session, the mechanic will give the bikes a general check over and will give advice and recommendations if needed. 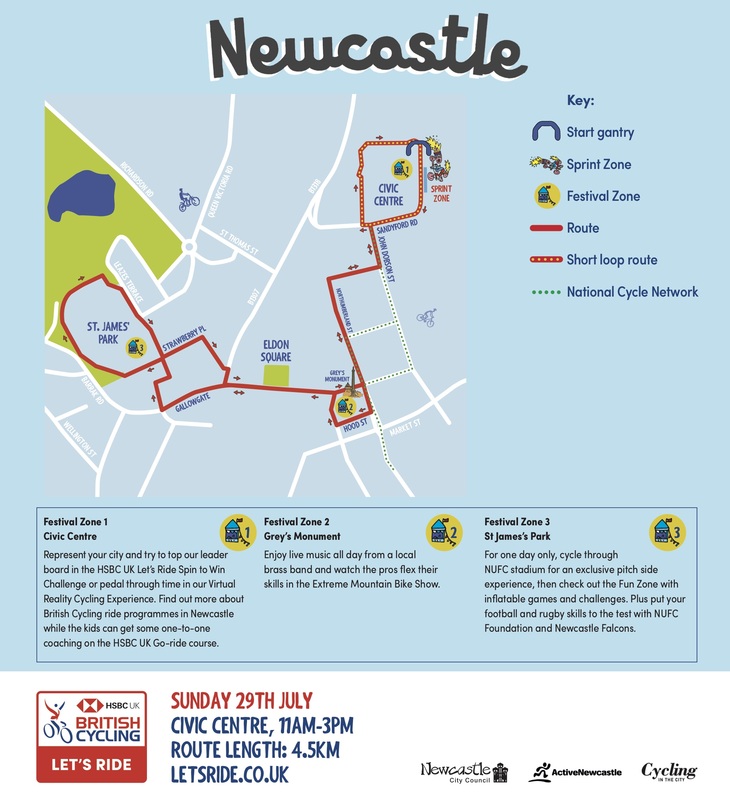 Sunday 29th is the annual HSBC Newcastle City Ride – where a loop around the City Centre is closed off to vehicles – so totally safe. SPACE people are planning to ride in together, meeting at Gosforth Central Park War Memorial at 10:30 leaving at 10:45. We’ll be heading down through Jesmond on quiet roads and the new cycle paths near Jesmond Metro. Link to our route below, do come and join us, always nice to ride in a large crowd. The City Ride itself starts by the Civic Centre and does a loop around the centre of Newcastle including pitch-side at St James’ Park. Further details on the Let’s Ride website. Cycling Without Age – Newcastle upon Tyne will be joining us at Gosforth Central Park. He’s a video from BBC Newcastle showing what they are all about. 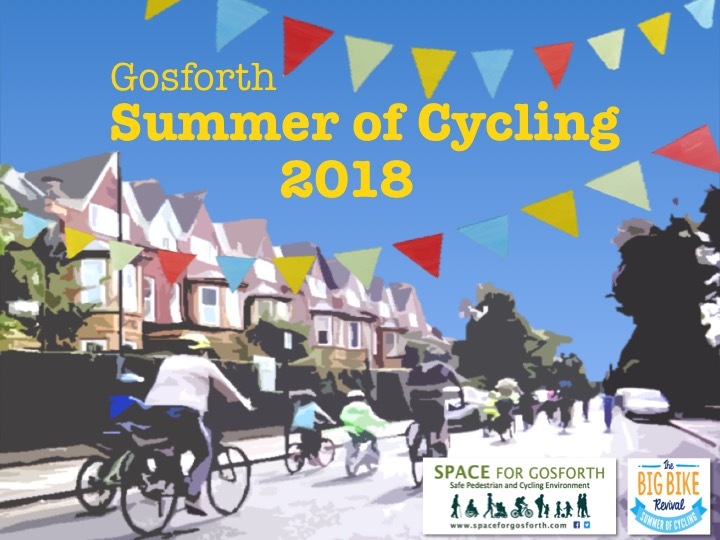 This entry was posted in Children, Cycling and tagged Archibald School, Ashburton Residents, Challenge Ride, children, cycling, Dr Bike, family ride, Go-Ride, Gosforth Central Park, Handlebards on June 12, 2018 by SPACE for Gosforth. Hi Wayne, if you mean the family ride on 17 June then yes that is free. Having read about our Summer of Cycling post, Heather at Edinburgh Bike Co-op sent SPACE for Gosforth this info. If your bike hasn’t seen many miles recently, it’s always best to get it checked-up by a bike mechanic before you take it out to make sure it’s still safe and comfortable to ride. Pop into our Newcastle store in Byker and they’ll give it a free check-up where they’ll look at things like the tyres, breaks and gears for wear and tear or damage. If they find anything that does need work done, you can book it in for a service. Alternatively, you can always book yourself on to a bike maintenance class and learn how to keep your bike in tip top condition yourself. comfortable. However, most people find panniers the most convenient and comfortable way to carry everything from laptops to nappies. They attach to the side of your bike (so you don’t get a sweaty back) and you can get them on one or both sides. The only thing to note is that you’ll need to get a pannier rack fitted to your bike if you don’t already have one, but don’t worry – we can do that for you! plenty of events as part of Gosforth’s Summer of Cycling to get the family out and about on their bikes. For very young children, you might want to consider a good quality seat that attaches to the back of your bike… Some have features like reclining seats so they can even have a snooze if the excitement is too much. Balance bikes are a great option for toddlers to teach them vital balance and steering skills. Remember, if you’re in the market for a new kids bike, whether that be a pedal or a balance bike, choose a good quality brand like Frog that you know you can trust for safety, quality and lightness of the frame (which makes it far easier for the child to ride). For anyone biking with children Cycle Sprog is a fantastic resource well worth checking out. Written by parents for parents, it’s all about family cycling with honest information and reviews of kids bikes, children’s cycling accessories and family friendly cycle routes. And for shopping Bicycle Dutch is truly inspirational! Great video. If you know of any other websites on these topics please share.